I had given Somerfords Fishing Association a free days fishing on the river Stour at Throop for an auction prize to raise money for fishery improvements on our stretch of the Bristol Avon. 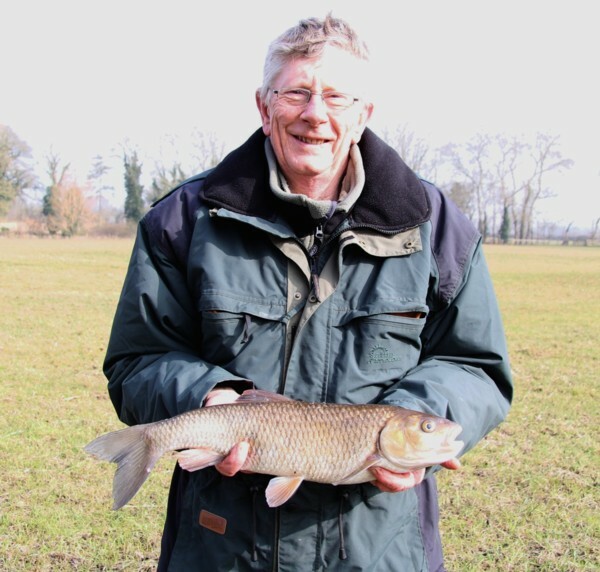 John Dutton was the angler who bid the most and so therefore in the summer we had planned to fish down at Throop during the winter. We continued to look at the forecast and river levels for the entire winter and with the rain and the river being in flood we decided to postpone the event until next year. Of course I could have taken him down there and caught nothing, but why do that. He has donated a sum to the fishery improvement fund and deserves a good time. So as a small compensation we decide to have half a days fishing on the Somerfords river and try and catch a chub or two trotting. So we set a date of March 4th. The session was for about 5 hours in total and involved trying a few swims. I got there quite early in the morning and started ledgering some cheese paste just to illustrate that static baits wouldn’t catch the chub. Sure enough after 1.5hrs nothing came along not even a pluck or pull. John arrived at about 8.30am and we started to feed a swim that holds plenty of chub with maggots. Sure enough after feeding for about 20 minutes it was time to trot through. The chub were sure to be feeding as it was 6c and supposed to be increasing to 10c during the day. Well after about 4 trout and no chub we decided to move on. The next swim is one which had changed much due to the severe flooding and it was now possible to trot the swim and cover the water really well. It was prove to be very good. I think we had 5 chub and 3 more trout from this swim. The largest of the chub was 4lbs 4oz. It was great fun trying to play the chub away from the snags of the over hanging branches. In small rivers and swims then it’s only possible to take so many fish before they become spooked. So it was time to try another swim. And guess what another trout! Who says there are no trout in the river! Our next swim was on a sweeping bend that just screamed out chub. 3 trout and one chub later, perhaps it should have screamed trout! As the sun rose higher in the sky and the cloud disappeared the fish just didn’t want to play ball. At 2pm we decide to call it a day. John said it was one of his better days fishing and thoroughly enjoyed every minute of it. As we returned to the cars we said our good byes and I headed off to look for some big roach that are usually around and he went home a very happy man. I hope when we eventually get down to Throop next year he might be happier still. In the end the roach were not around so I headed further downstream and decided to fish for chub with some cheese paste. 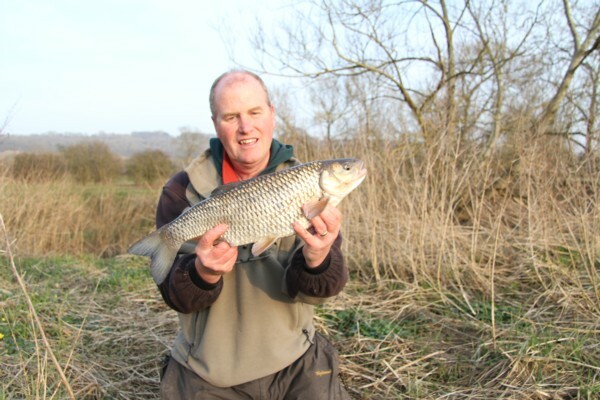 The swims I fished do contain a few chub and first fish turned out to be one just over 4lbs. The rod tip gave a pluck and as you fell this then you move the rod towards the fish and sure enough it takes more line and then the strike usually means the rod hoops over. This one put up a real tussle. Then I lost one with a hook pull which is very unusual. I moved swims and had a very quick pull that I missed. thinking it could have been from one of the large roach that frequent the swim I recast. Then once again the rod nodded and I gave the chub some line. This time there was no mistake and I landed a lovely chub of 4lbs 4oz. I fished on in another swim and have a few plucks and pulls but nothing materialised into hooked fish. So that was it for the day and very nice it was. So the next day was Tuesday and I needed to get the car and tackle set up for two days on the river Stour and Throop with Steve. This entry was posted on Friday, March 8th, 2013 at 9:51 pm	and is filed under Uncategorized. You can follow any responses to this entry through the RSS 2.0 feed. Both comments and pings are currently closed.